With all the ads urging homeowners to refinance their homes, it makes people wonder if they should and how exactly would it benefit them. To refinance your mortgage means that you are paying off the remainder of your existing loan and replacing it with a new one, or changing the terms of your existing mortgage. Any homeowner who currently has a mortgage and is seeking change is a great candidate for refinancing their mortgage. They could refinance and get a new kind of mortgage or they can adjust their mortgage so that it has better benefits for them. Find out if it makes sense to refinance by using our refinance calculator. 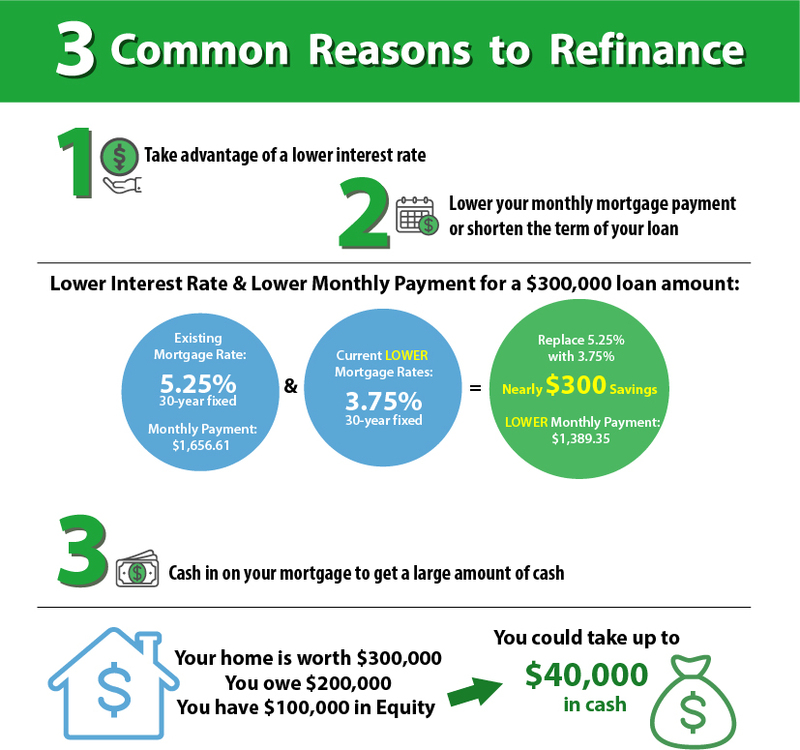 Each of these reasons hold different benefits depending on the homeowner and their priorities, so continue reading if you want to see if you can reap the rewards of refinancing your mortgage. One of the most common and best reasons to refinance is to lower the interest rate on your existing mortgage. The average homeowner could save up to $3,000 per year just by refinancing their mortgage. By reducing the interest rate, you can not only save a lot of money over the life of your loan, but you can pay down your principal faster. What many people do not realize is that with a 30 year fixed rate mortgage, most of the payments during the first 12 years are mainly to pay off the interest. This means that after making monthly mortgage payments for 12 years, you are now just starting to actually pay off your loan. With a lower interest rate, you can start paying off your principal sooner because if you have a lower interest rate, there is less interest to pay off. You do not have to wait until the market has lower interest rates in order to refinance and take advantage of a lower interest rate. You can also simply work on your credit score and wait for it to improve. With a higher credit score than the one you previously had when you signed your mortgage, you could qualify for a better rate than the one you currently have. Even though lowering the interest rate could get you a lower monthly mortgage payment, you can also lower your monthly payment by refinancing into a different mortgage. If lowering your monthly mortgage payment is of the highest priority, the most certain way of doing this is to refinance your existing loan for a different loan, or refinance it for a term longer than what is left on your mortgage. Maybe you want to have disposable income or more breathing room for your finances every month, or maybe you want to improve your quality of life and have more money each month to experience new things and travel. There are a multitude of reasons as to why people want to lower their monthly payment amount and sometimes predicting and waiting for the rates to fall can seem like an eternity, which can make it feel as if the solution is within your grasp, yet so far away. If you are currently in a 15 year fixed rate mortgage, and you decide to refinance into a 30 year fixed, you will have a lower monthly payment. Similarly, if you are currently in a 30 year fixed rate mortgage and you have been consistently making payments for 10 years, by refinancing your current mortgage back into a 30 year fixed, you will now have lower monthly payments because your remaining balance is now divided by a higher number, which ultimately yields a lower number. If paying off your mortgage and getting out of debt as quickly as possible is your main reason for refinancing, then you can also accomplish this by refinancing into a mortgage with a shorter term. If you have recently found yourself finally getting that promotion and making more money than you did at the time you signed your mortgage and can now afford a higher monthly payment, refinancing into a 15 year fixed rate mortgage is a great idea. By refinancing into a 15 year fixed, you are not only going to finish paying off your home in only 15 years because you will be paying off the principal at a much faster pace, but because you are drastically shortening the term of your loan you could also be getting a lower interest rate. By also getting a lower interest rate, you are saving money overall during the life of your loan by paying less money in interest, so even though the monthly payments are a bit higher, the total amount that you paid will be less. Although the monthly payments of a 15 year fixed are higher in comparison to the monthly payments of a 30 year fixed, you will have fully paid off your home in just 15 years and can now pocket the money that you would have been paying in mortgage payments for the next 15 years. While many homeowners refinance their mortgages in order to take advantage of a lower interest rate or to lower their monthly payment or reduce it to a shorter term, there are homeowners who will do the opposite. Homeowners who have an adjustable rate mortgage (ARM) have refinanced into a fixed rate mortgage and ended up getting a higher interest rate and a higher monthly payment, but received a sense of security. An ARM is a hybrid mortgage meaning that during the initial period of 5 years the interest rate is fixed, but once the initial period is over, the interest rate will adjust once a year according to the market. During the initial period, the monthly payment is typically lower than the monthly payment of a fixed rate mortgage, but once the initial period is over and the interest rate adjusts, that could change. There are ways to prepare yourself for the change and to calculate it either through a banking professional or by yourself, but it requires some research on your part if that’s the route you want to take. By refinancing from an ARM to a 30 year fixed, you will most likely get a slightly higher interest rate than the interest rate you received during the initial period of an ARM and the monthly payments will be slightly higher, but at least you won’t have to worry about your monthly payments fluctuating. A fixed rate mortgage means that the interest rate will remain the same throughout the entire term of the loan, so every month your monthly payment will be exactly the same. It is an investment that yields the reward of stability and relief from uncertainty associated with not knowing how much your new monthly payment will cost. Another way refinancing can be seen as an investment is through a cash out refinance. With a cash out refinance, you refinance your current loan for an amount more than what you currently owe and then you will take the difference in cash. With this large sum of cash, it is advised that it is to be used as an investment for a long term purpose. Examples include remodeling the house so that the home value is increased and paying off credit card debt to improve your credit score. You could even use it as a down payment for a second home to rent out to others and have another stream of income. Ultimately it is up to the homeowner how the money is spent, but because the sum of the cash is included in your mortgage payments you are paying interest on it therefore, it is not free. Going on a shopping spree or taking a luxurious vacation isn’t the smartest way to make use of these funds. 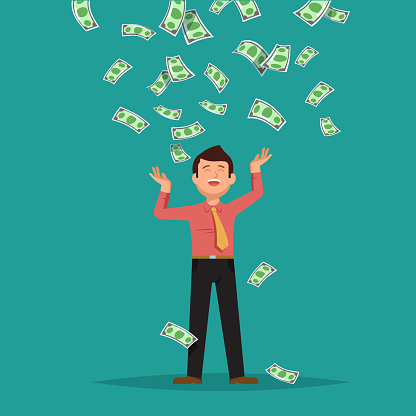 Before you take out a cash out refinance, you want to make sure that there is a certain purpose for it and that the end result will financially benefit you in the end. Refinancing your mortgage has many benefits that cater to many different needs and priorities. At the time of signing your mortgage, you might have had a different set of priorities and now the circumstances have changed. The great news is that you are not chained and expected to stand by your mortgage for the remainder of its term. With the option to refinance, homeowners have the opportunity to adjust their current mortgages to reflect on their current stage in life and the changes that came with it. If you are currently happy with your existing mortgage, you are more than welcome to continue paying it off. Just know that you are able to tweak it to better suit your needs. Whether your goal is to pay off your home as rapidly as you can, lower your monthly payment, invest in yourself, or have a sense of security, refinancing your mortgage could help you maximize your quality of life. Use This Tool To Calculate Your New House Payment.